Barb has been having fun playing with the Monster Mash set! And who wouldn't...they're so adorable! She stamped each of these cuties using bright chalk inks then lightly colored each in with a coordinating colored pencils. She built her sentiment using individual words from Chatterbox. I love the color, the different punched edges and the sheer volume of shifty eyes, especially the one sitting smack dab in the middle of the bow! Feel like you're being watched? 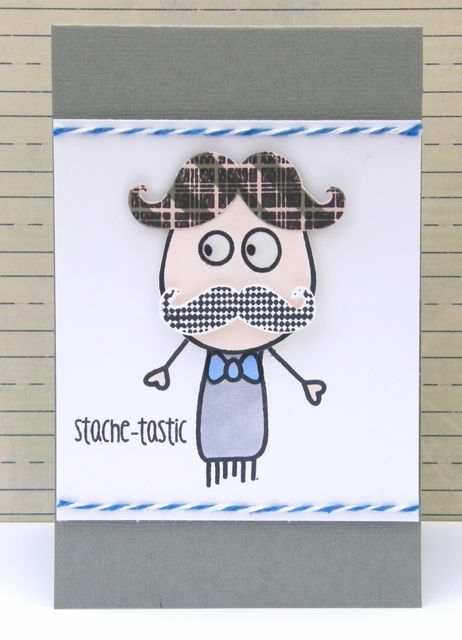 ;) don't worry they are friendly..
Annette has gone Stache-Tastic and created this fun little guy using Mustache Mania and Monster Mash. I love how she used Mustache Mania and made him some hair with one of the fun mustache's, she used the bodies from 2 of the monsters to make up this guy.. The possibilities are endless. Cute little monsters, and fun stache guy! !